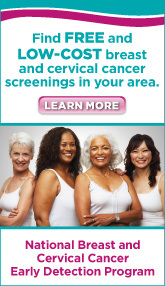 All women are at risk for breast and cervical cancer, but regular screenings can prevent or detect these diseases early. The U.S. Preventive Services Task Force has established guidelines for screening, but you should discuss with your health care provider how often you should get screened. Breast cancer: Women between 50 and 74 years old should get mammograms every two years. Those under 50 should talk with their provider about when they should be screened. Cervical cancer: Women should get their first Pap test at age 21 and continue screening every three years until age 65.
you live a healthy life.